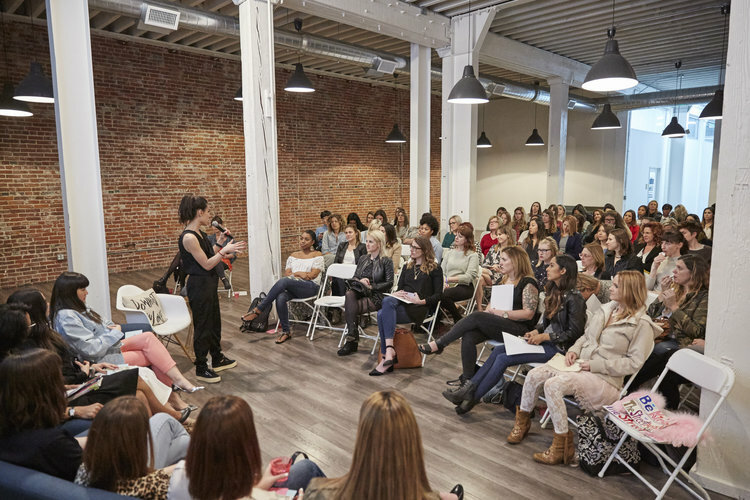 This is a recap of our first town hall in Los Angeles, "Women & Money," on March 2, 2017. The ladies of Los Angeles came out in full force for our first town hall—almost 100 of ‘em!—and let me tell you, they showed up ready to share stories AND spill secrets. We heard from freelancers and full-timers, lawyers and non-profit workers, women reinventing themselves mid-career and others just starting out. And though we heard success stories as well as “learn from it” moments, the biggest takeaway was something we already know to be true: it can be hard out there for a lady trying to get paid. Thanks to The Unique Space for hosting our first town hall. It was an evening about opening up the floor to have a transparent conversation about women and money, period, and it got real pretty fast. One of the first discussions of the night was about the pros and and cons of working for another woman. One of our speakers spent years working with a high profile male boss with a reputation and told us it was the best professional experience she’s ever had. Then we heard from another speaker who’d only really worked for women, and every single time was terrible. It made us realize that the only way to stop this cycle—and therefore one of our biggest responsibilities as women in the workforce—is to support other women. Our speakers echoed this sentiment, and they reflected a diverse set of professional experiences, from a longtime private investment consultant used to being the only woman in the boardroom to a freelance UX designer who almost got bought out—the supposed dream—but didn’t take the jump. We also learned about golden handcuffs, acqui-hiring, and full compensation. Know what these mean? Many of us didn’t, but now we do. That’s the power of conversation. Keep asking. At three month reviews. At year-end ones. At important milestones. Just keep asking, and gather the evidence. Sonja Rasula told us about her way-ahead-of-her-time breadwinner mother who taught her to ask for raises at every opportunity and to always bring supporting evidence. Jot down a list of the projects you spearheaded, the money you saved the company with and/or an idea you implemented. Or maybe a great new hire that you brought on. Keep a record, keep it with you, and keep asking. It’s never failed Sonja, and it made us feel, well, maybe we aren’t asking often enough. Maybe we aren’t owning our accomplishments in this way. Is company culture worth a pay cut? Are you comfortable with working beneath your value if the company you work for is “cool” or has some other credibility, perceived or otherwise? And if it isn’t money, what else is culture fit asking you to sacrifice? Speaker Puno Dostres worked for one of the “hottest” brands around, was offered 5-figure bonuses and given leeway to build her own team. Ultimately, she told us, burnout was the best thing that happened to her. Now she runs her own business, and is confident enough about it to refuse a big buyout, especially when it's for the wrong reasons. Another thing to keep in mind about culture fit: it’s more than just what snacks are available or how late everybody stays. Culture fit is something that ladders down; it’s a part of the founder’s personality that is built into how their business works, subconscious or not, and it’s important to be aware of that before making any sacrifices for it. Take them. With entrepreneurship and solo-preneurship on the rise, many of us wondered, is it worth the risk? No matter how you look at it, risks are a fundamental part of our professional experience. Be smart about them, plan for them when you can, but take them. Ask yourself, am I going to regret doing this? And just as important, will I regret NOT doing it? And while the entrepreneurs on our panel were quick to point out the scariness of instability, they all still took that jump, so it’s no question that risk reaps reward. Speaker Kelly Alexander ticked off a list of the richest people she could think of off the top of her head, and all of them were entrepreneurs. Point being, prepare as best you can and go for it. (Sound familiar? The advice we heard about asking for raises is essentially the same idea.) This doesn’t mean everyone should be an entrepreneur. It means you should bring an entrepreneurial mindset to what you do, which inherently means taking risks. They give great advice. Closing out the evening, Kelly shared a short list handed down to her by her mother, a “filter” she applies to everything she does. 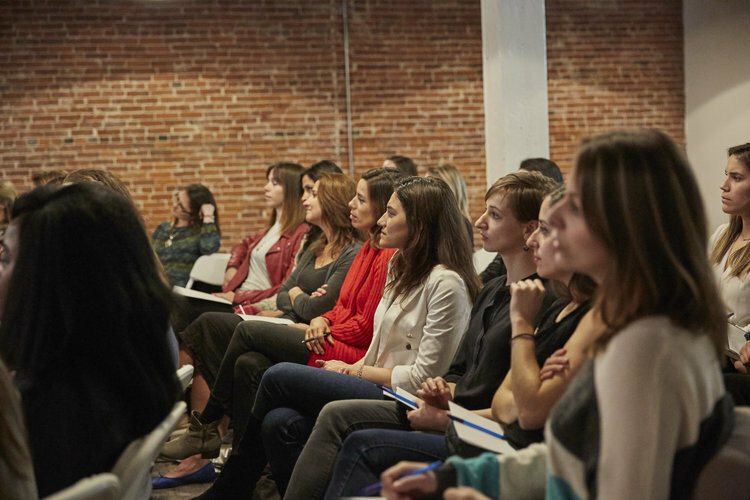 Want to bring a Ladies Get Paid town hall to your city? Let's chat. Drop us a line to learn more about our ambassador program.